Sounders GM Adrian Hanauer is skeptical that Mexican players will soon dot MLS rosters, but he thinks new TV deal can bring Mexican-American fans to the the U.S. league. When it comes to the future of MLS, Sounders FC general manager and owner Adrian Hanauer is decidedly optimistic. 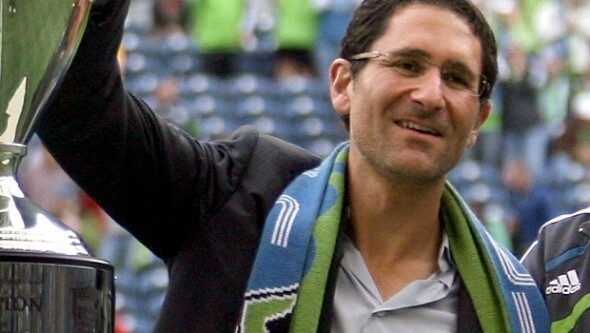 Hanauer has been a keen observer of soccer winds since 2001 when he plunged into professional sports as a minority owner of the then-minor league Seattle Sounders. That team played in front of small crowds and had almost zero media scrutiny. Now Hanauer runs an operation that is the envy of many in MLS in terms of fan interest, media coverage and revenue generation. But he reins in his enthusiasm somewhat when discussing the potential impact of the league’s new TV deal and whether it could lead to more players joining MLS from the more robust and prestigious Liga MX in Mexico, a scenario discussed here Wednesday. While money is a driving factor in soccer, as in all pro sports, other factors are at work that might deter a young Mexican league star from jumping into MLS. Liga MX is extremely well off financially in terms of TV and commercial deals. The competition is fierce and, unlike some leagues, not confined to the usual top teams — eight sides have won the Liga MX regular season title in the last 10 years. But to borrow a line from Hanauer, the winds are shifting. The league’s new TV deal — $720 million over eight years — that kicks in next year will pump a lot of new money into MLS. Part of that deal includes Spanish-language giant Univision, which will cross-promote MLS coverage (among other things, a Friday night game of the week) with Liga MX coverage. Univision’s coverage of Liga MX has done remarkably well in the U.S. According to a story from goal.com, when Leon traveled to Pachuca for the second leg of the Liga MX Clausura final on May 18, 4.7 million U.S. viewers tuned in, making the game the highest viewed soccer match in America this year from any league in the world. The story said that a regular-season game on Univision between Mexican sides America and Veracruz in March had a higher rating than any of the nine NCAA men’s basketball tournament games on TNT and Tru TV in the same week. Hanauer gets bullish again when he talks about the TV deal’s Univision component. Ratings for soccer coverage are eye-opening, and should, in theory, lead to more viewers and more money for MLS. According to the 2010 census, 31.8 million Americans of Mexican descent live in the U.S. Analysts say that number is now more than 34 million. Hanauer said that influenced Univision joining MLS as a partner. While he doesn’t think the new TV deal will immediately lead to top Mexican stars looking to jump to MLS, the possibility is on the league’s radar. Despite a restrictive salary cap, it seems inevitable that MLS teams will continue to increase spending on players. The TV deal isn’t the only harbinger of growth in MLS. The New York Yankees and Manchester City have paired up to start a team in New York City next year (NYC FC). Atlanta Falcons owner and Home Depot co-owner Arthur Blank has purchased a team that will join the league in 2017 and play in Atlanta’s NFL stadium under construction. David Beckham is close to a deal for a stadium and team in Miami. A lot of money and power is entering the league in the next five years. As the league grows it seems inevitable that the potential of mutually beneficial business deals between MLS and Liga MX will arise. Perhaps Hanauer is right that it won’t necessarily involve Mexican stars looking to play in the U.S. But it could involve a unique competition. Here’s an idea worth considering: Borrow from the NCAA and stage an MLS/Liga MX challenge series where each MLS team would play one match a season against a Liga MX club, with the match counting in each league’s standings. Such a series would definitely have interest and would be tailor-made for TV. The execs at Univision would be doing cartwheels at the thought. Liga MX fans might question why the league would do such a thing. The answer is obvious: A chance to increase their footprint among American fans. Big, successful leagues stay big and successful by always looking at ways to grow. As for MLS, the benefit of a challenge series against their neighbors would be immediate and obvious. It would give the league a chance to keep punching above its weight. I hesitate on loosening the salary cap but when FIFA and so many other sports leagues are throwing millions around that pretty much forces MLS to be more in line with them, even ones that aren’t soccer leagues. Even though I’d love to see a few more teams I don’t think that’s what MLS really needs. Amerca’s sport dollar goes in so many different directions and MLS in comparison is the new kid on the block. They need to make a big splash with fans and bringing Dempsey back was a step in that direction. Getting Beckham to close out his career here was also a plus. Now they need to see about getting some bigger name players though that’ll take time though this TV deal will help in that direction the way the Mariners getting ROOT Sports helped them get Cano. Of course, winning the World Cup or the gold in the Olympics would really be a boost in interest. “The money is good, cost of living is low, and Mexicans have a tremendous pride and patriotism in their country.” Hanauer may have nailed it with that quote. Mexican soccer fans will ALWAYS place Chivas, America, Pumas, Cruz Azul, et al, above any MLS team. They might come out to watch a Premera Divison player on a USA team but with satellite and cable TV bringing Liga MX games into their homes every week, they’ll continue to have reason to ignore MLS unless they’re really Jonesing for a match in July. Sometimes people let raw demographics get in the way of reality. Just because you see numbers in a certain segment of the population, you can’t count on that segment buying your product. Ask anyone who’s tried to make hockey work in Victoria.